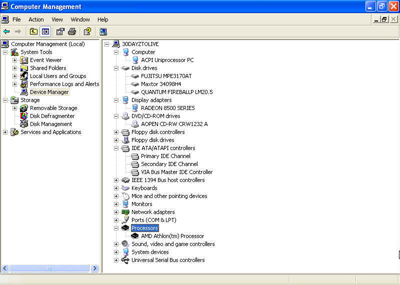 To reach the device manager in Windows 2000/XP you must go to the properties of my computer, as above, then select the 'hardware' tab and the 'device manager' button. This screen show you Windows' opinion of what hardware is present in your computer, and can be used to identify misconfigured hardware and re-install drivers. It also gives us a fair amount of information. Present as you can see are the IDE devices, video adaptor, processor type and assorted other info. The major problem with using the BIOS, the POST screen and the OS to enumerate your hardware is that it is rather difficult to find out one of the single most important things you need to know when upgrading your PC; the type and brand of your mainboard. Once you know this, you can visit the manufacturers website to get the scoop on what processor range it will support, how much RAM it can take, etc. To find out for sure, we are going to need to open up the PC. NOTE: If your computer is from a major PC manufacturer such as Dell or IBM, chances are you have a proprietary mainboard, specially made for that company. While the chipset will be the same as other boards of the same class, getting support and info for the board is likely to be a hassle. Also, consider that with Dell and most other major manufacturers, opening your computer up within the warranty period is a no-no. Please keep these factors in mind when considering your upgrade options. On the plus side, Most of these manufacturers do use regular ATX cases and power supplies, so chances are you can at least put in a new mainboard. After you have got the side of your case off, let's check a few things. Most importantly, check for the brand and type of the Mainboard. Most manufacturers screen it somewhere on the body of the motherboard. Once you have found this, check the number of free PCI expansion slots you have, In case you wish to add peripherals like network cards or soundcards later. Now take a look at the available memory slots. And check out the status of your IDE controller ports. Each wire that comes off of these two ports can support up to two IDE devices, such as hard drives, CD drives or ZIP drives. Count them up. 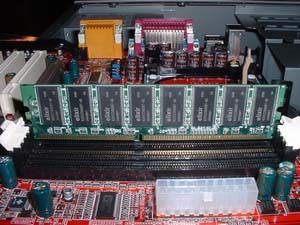 Note that some modern boards may contain an extra onboard IDE controller, giving two more ports and four more available devices. Consult your manual if you have it, or the manufacturer's website for more info.